Last week I attended SLA Europe’s seminar "Tweeting While You Work" I was really looking forward to this event as it had been a while since I'd attending anything and Twitter is a tool that I use regularly although less so nowadays. The speakers in the order they presented were Dr Hazel Hall (hazelh; LISResearch; CentSocInfo) of Napier University in Edinburgh, Julie Hall (juliehall) of Women Unlimited and Julie Lewis (judithlewis; Seshet) of Seshet Consulting they each gave their view on using Twitter at work and as part of an Information Professionals work. It was very interesting to hear what they all had to say, the most interesting presentation by far was Hazel's who used Twitter to provide 10 tips on using Twitter in 10 minutes. This was a great way to demonstrate another way to use Twitter. Hazel's slides which include all the tips are available here. One thing which made me pay attention was a point Hazel made about privacy settings on Twitter. It was literally the only thing I wrote down the entire night and was something like "Restricting access to your Twitter account is liking going to a nudist beach and leaving all your clothes on" I'd liked the analogy but I didn't and still don't entirely agree with the point Hazel was making. A few of the people I follow restrict access to their Twitter accounts, that is you have to request to follow them. I can see why they do this as it's very frustrating to be followed by some completely random person or organisation who you have no affiliation with and you cant see any reason why they would follow you. I know if I was to look through my Twitter followers a good percentage of my followers will be people or organisations I have no interest in following and what value they get from following me I don't know so that is at least one good reason for restricting who can follow you on Twitter. 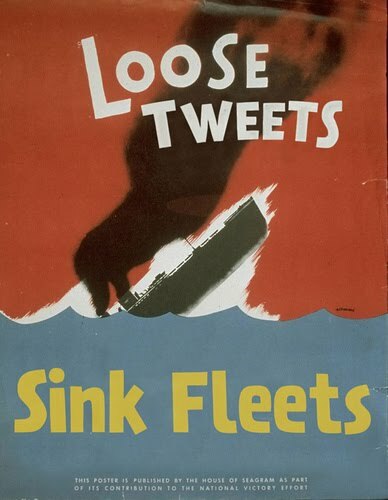 If you're wondering why I've included the "Loose tweets sink fleets" picture in this blog post some of the discussion was around seperating your work tweets and personal tweets, which can be quite diffcult to do. There were a few suggestions about how to do this with the most obvious being to create two Twitter accounts, one for work and one for your personal life or just use Twitter for work and use another social networking site like Facebook for your personal life. 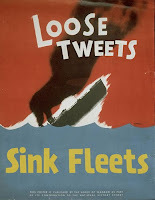 What's important to remember is that if you use Twitter regularly and build up some followers people will expect you to Tweet about particular subjects so if you suddenly go "off piste" and start Tweeting about random subjects you might find yourself losing followers pretty rapidly. So far the event’s also been covered by VIP, WoodsieGirl, Uncookeddata and will no doubt feature on the SLA Europe blog. If you'd like to see photos of some of the attendees and speakers Photos are available for viewing on Flickr. This entry was posted on Friday, 26 March 2010 at 10:15 and is filed under Social Media, Social Networking, Twitter, Web 2.0. You can follow any responses to this entry through the RSS 2.0. You can leave a response.